I’m totally immersing myself in the philosophy that children need to experience music and internalize it, understanding it with the whole body, before we start “teaching” the elements. In addition, we need to present the learning to our students in a variety of ways in order to get to the concepts, and children need to make connections between the elements they study in Music and the things they already know. 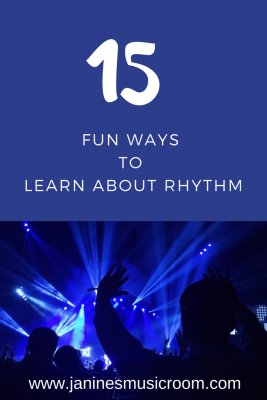 When I start talking about rhythm, it’s not enough to just echo the standard “ta” and “ti-ti” patterns. Of course we do a little of that, but it gets boring pretty quickly, and it’s very limiting in their exposure to more complex, natural rhythms. Play a melody on the piano (or some other instrument) that utilizes a repeated rhythmic pattern. After establishing the beat with the students, have them step the rhythm you are playing. 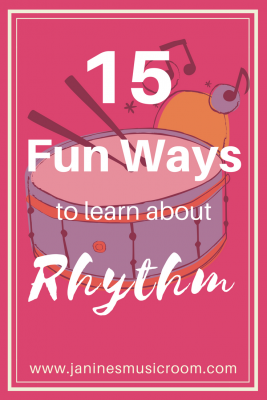 If you are working with older students who know the rhythms already, ask them to clap and say the rhythm pattern back to you after you stop the music. Introduce body percussion, using patterns of any complexity in layers and sequences. This could be as simple as a “We Will Rock You”-inspired “stomp stomp clap rest” or as complicated as a Stomp performance! Put on a popular song from the radio and ask students to be the drumset: stomp on beats 1 and 3 for the bass drum, clap on 2 and 4 for the tom-tom. You could even split those up, depending on your focus. Some children might tap a pencil on the floor for the hi-hat. Building on that, take a single answer and find out how many different rhythms they could use to speak that sentence. “I ate eggs and toast” could be: ta ta ti-ti ta / ti-ti ti-ti ta rest / ta syncopa ta / ti-ti ta ta ta. And those are just a few options within 4/4. You could try a triple meter, or a compound meter. Play clapping games! They often require students to perform beat and rhythm simultaneously. Sing or chant nursery rhymes and fingerplays with young children. Give students a prompt on a flashcard: It could be a phrase or even a photo (for which they can come up with a description or caption). Challenge them to set it to a rhythm. More advanced students could be challenged to do both a simple meter and a compound meter. Follow the leader: Using a piece of recorded music with a strong beat, choose a student to be the “leader”. The leader decides on a rhythmic ostinato to perform to the music, which the other students copy. The leader can change the ostinato at any time. For a variation on Follow the Leader, you can have one student who leaves the room when you choose the leader, then that person has to figure out who the leader is as the ostinato changes. Have everyone sit in a single file line. Tap a rhythm onto the back of the last child in line. That child taps the rhythm on the back of the student in front of him/her. Continue to the student at the front, who claps the rhythm out loud. It’s basically like rhythm “telephone”. Take any of these ideas and move them onto instruments! With younger children, avoid shakers, maracas, and tambourines, which tend to get extra sounds as they rebound from the actual shake. In good Kodaly form, I aim to present them with music that is beyond their technical understanding and that has aesthetic value to it. So while I have rhythm learning in the back of my mind, I am usually not naming or writing these rhythms until later. But when I want to name them later, the students catch on very quickly because they have had so much experience with them already. What are your creative ways to work with rhythm in your classroom?